A bisphenol A (BPA) molecularly imprinted polymer, the composition of which was optimised using a chemometric approach, has been applied to the selective preconcentration of the template from aqueous samples. 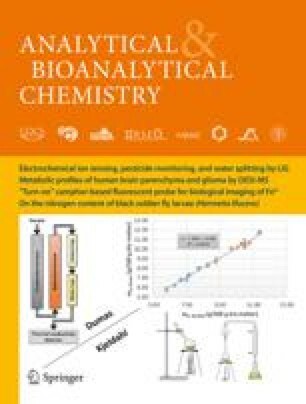 The selectivity of the polymer toward BPA and related compounds was evaluated chromatographically. The BPA-imprinted polymer was packed in a column and used for continuous on-column solid-phase extraction (MISPE) of aqueous samples followed by subsequent analysis by HPLC with fluorescence detection of the eluted fractions. The composition of the washing solvent applied in the MISPE procedure was optimised to favour the specific interactions of the MIP with BPA and to remove the non-selectively bound matrix components. The MISPE method has proven to be effective for selective preconcentration of BPA in aqueous samples (recoveries >84% obtained in the eluate for 10–100 mL sample volumes) enabling detection and quantification limits of 1.0 and 3.3 ng mL−1, respectively (based on 25 mL sample size). Analytical recoveries were between 92 and 101% for river water samples spiked with known amounts of BPA (30, 60, and 80 ng mL−1); relative standard deviations (RSD) were lower than 5.0%. The authors gratefully acknowledge the Madrid Community (ref. CAM-07 M/0082/00) and the Spanish Ministry of Science and Technology (Project No. BQU2002-04515-C02-01) for financial support. B.San Vicarte and F.Navarro Villoshada thank Madrid Community for a post-doctoral grant.